EF mount is a weird choice - it's unfortunate they didn't go with micro 4/3 - would better match the camera's size. As I understand m43 mount info is still not shared or possible to obtain. Look at lot of issues M1 or Z-CAM have. That or this camera will also never ship after being announced. 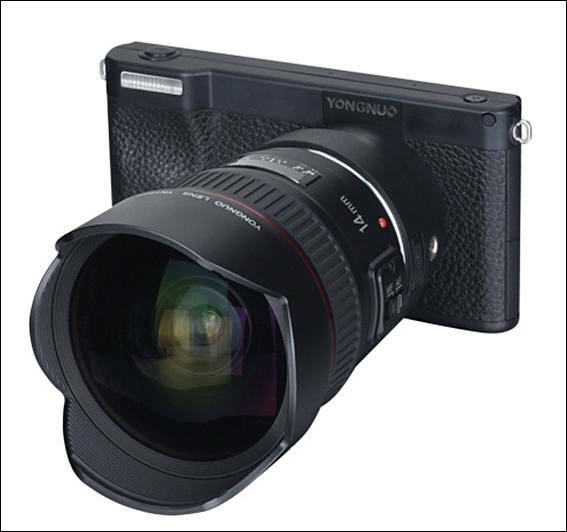 Wonder if Yongnuo will succeed where Samsung failed with the Samsung Galaxy NX / Samsung Galaxy Camera, I doubt it. But I hope they do. 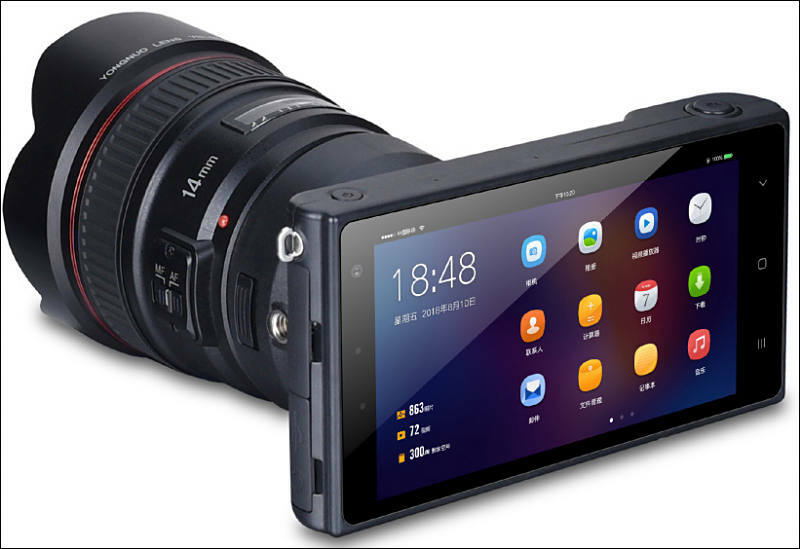 Strange, such a big mount for such a slim camera! 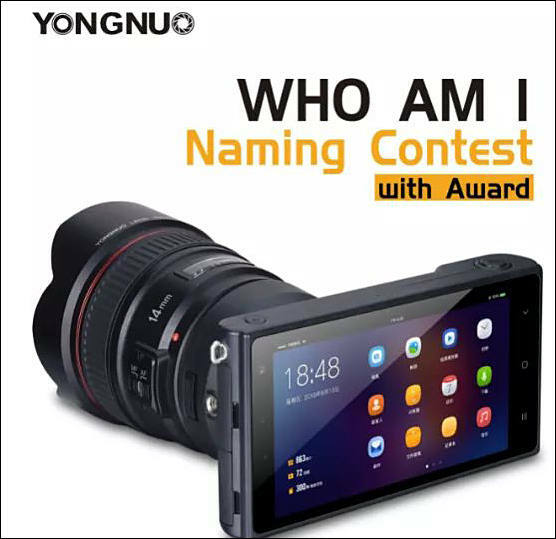 YN450 camera will feature a memory card, headphone jack, 4000mAh battery, 4K/30fps video recording, support for RAW files, and built-in GPS. Bad ergonomics - and is that a flash on the handgrip? Not that built-in flash is ever great, but I'd still generally try to avoid putting it in the place where people tend to put their fingers. Also, since the body is so small, the any moderately wide angle lens is apt to throw a big shadow. With used mount all design makes no sense. 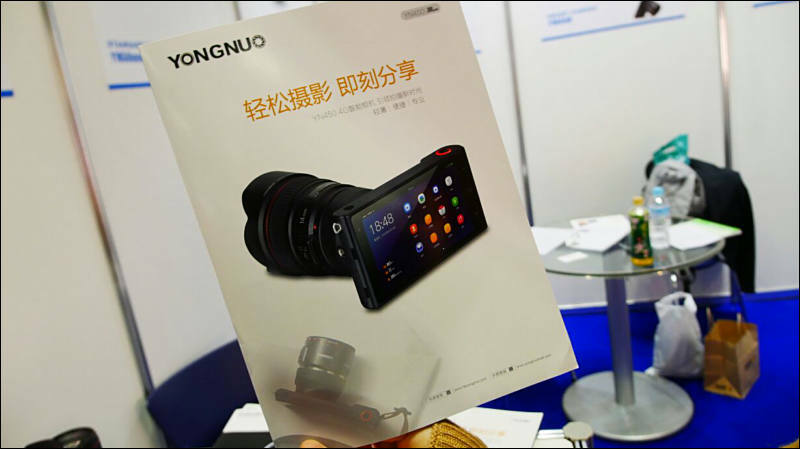 The YONGNUO camera, code name YN450, runs Android 7.1, features a 5inch 1080p touch-screen, however sensor details have not been shared. Camera records 4K 30fps video, has raw support, stereo microphones, a headphone socket, a MicroSD card slot, and 3GB/32GB built-in. There's support for 3G/4G, GPS and Wi-Fi, and there is a 4000mAh battery built-in. 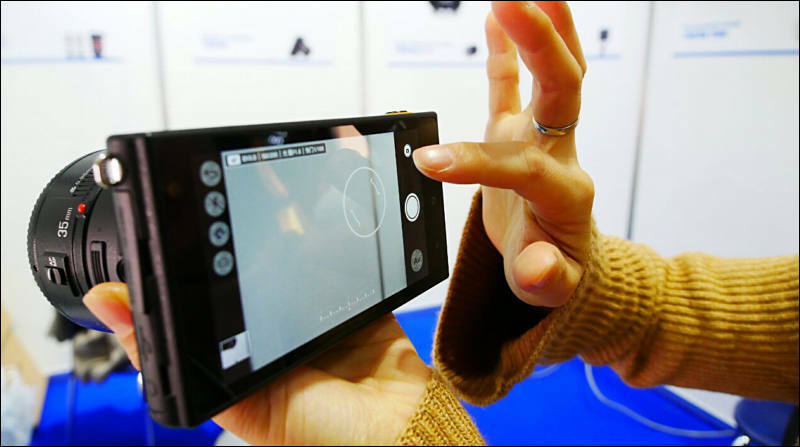 There's also an 8mp "selfie" camera built-in, which you can see next to the screen. "Yo dawg, we heard you like cameras... so we put a camera in your camera so you can shoot selfies while you're shooting landscapes..."
Not madness, it is much much worse - capitalism. Private info, patents, lawsuits. Are there android apps that allow for raw recording? I don't think so. Last time I used one, Cinema 4k (https://play.google.com/store/apps/details?id=com.frozenvolcano.android.cinema4k&hl=en) was one of the best and it couldn't do a raw video stream. She said the battery is interchangeable. Put the cheap canon 10-18mm and this might be interesting. If there's a competent android app, this could be interesting. A cheap(er) BMpocket perhaps. It is not BMpocket, as it must use something like Ambarella as intermediate. Very similar to Yi 4K. @eatstoomuchjam....well look what happened to the E1. It's certainly worth $200 now. And I would imagine it would depend on a good app running on the device. I think they aim around $899-999.